Three day Orientation Ceremony for the first year students and their parents was held from July 20-22, 2017. Annual programmes, upcoming events were indexed. A guided tour of three floors of the library was conducted and a hands-on demo of operating the computer data base was also organised. The Zest Talent search was held on August 8, 2017 wherein the students were given 20 minutes to prepare and enact a skit. The session was conducted by the famous director and theatre artist Mr. Ajay Manchanda, National School of Drama. ZEST Theatre Society Inaugural performance on “The Play of Desires and Escapes” was played on August 18, 2017 by the students under the direction of Mr. Ranbeer Singh. The play was about a bubbling cauldron of dreams, desires, escapades and restrictions, of lipsticks and burkhas. A two Day workshop on ZEST Gender Sensitisation was held on August 24-25, 2017 in collaboration with the NGO, Breakthrough. The workshop aimed at breaking gender stereotypes and spreading awareness on various issues like domestic abuse and sexual harassment. Spectator, the annual literary bulletin was launched on October 25, 2017 commemorating the linguistic and artistic endeavors of Zestians. ZEST alumni, Rashi Srivastava of batch 2015 and Vikas Shukla of batch 2010 were felicitated for their exemplary achievements in their respective fields. While Rashi forayed into the literary world with her debut novel, “Sojourn”, Captain Vikas Shukla of Indian Army hoisted the ZEST flag high up. A syllabus based Lecture on Anita Desai’s novel “In Custody” was held on January 19, 2018 by Mr. Skand Priya, Assistant Professor, Department of History, Shivaji College, University of Delhi. The expert spoke on the development of Urdu as a language and the study of Urdu poetry in context of the novel. 10th annual ZEST Walk for the students, faculty and alumni of the Department was organised in Sanjay Van, Delhi on January 22, 2018. Apart from walking in the midst of nature, everyone contrasted their aspirations and experiences in department and the world outside. Film appreciation classes were conducted for the students of Generic class. Screenings, reviews and film analysis was organised for the films: MonaLisa Smile, Elizabeth, The Schindler’s list, Pride and Prejudice and Garam Hawa. Alumni meet was organised on March 24, 2018, followed by the Zest Literature Quiz conducted by Raghib Reza and Tanvi Grover, B.A (Hons) English 3rd Year. The Annual Literature Festival “Who’s Afraid of the Ides of March” was organised on March 26, 2018. It showcased an in-house talent along with various competitions. The Annual production of the ZEST Theatre Society “To the Truth of Who I am” was staged under the direction of Abhiskek Kukreja, Batch 2011. A lecture on “Women and Law” was delivered by Ms. Upasana Dhankar on April 4, 2018 for the students of subject “Women and Empowerment in India”. Members of ZEST and the members of faculty inaugurated the new faculty Room 508 in the new campus of DDUC on 4th Aug 2016.The aim was to create a new space and invest it with new energy and a new vibrancy. Sharing of experiences, discussions, in house talent shows, singing and music by the students were the highlights of the inaugural. In its Orientation Program held on 16th Aug, 2016 ZEST members acquainted the first semester students with the activities, and traditions of the society. The faculty members introduced themselves to the new students. A presentation on Zest was conducted by the seniorstudents. On 29th Aug, 2016, ZEST members came together to elect the new office members through a democratic voting process and speeches by the candidates. The votes were cast through a secret ballot. The new office bearers were announced immediately after Mehul Rawat – President, Ganesh Gautum - Secretary, Jagriti - Vice President and Kanishka – Treasurer. ZEST celebrated the auspicious occasion of Teacher's Day with a cake-cutting ceremony. The teachers shared their experiences and discussions followed. The students thanked the teachers by presenting them self-made cards, art-works and bouquets on 5th Sept 2016. During 5th and 6th Sept, 2016, ZEST organised an interactive two-day Gender Sensitization Workshop with Breakthroughfor the students. The workshop aimed to educate the students about gender equality, the nuances of gender discrimination through patriarchy. The workshop initiated discussions, debates, conducted interactive question-answer session, newspaper cutting and pasting exercises. Rapture, the Year Beginning Party marked the start of the first year students' journey with the department on 1st Oct 2016. 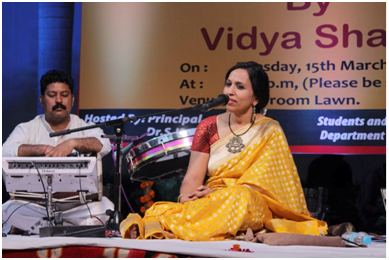 It consisted of talent showcasing, poetry, classical dance events, etc. The first year students competed in various talent rounds and some fun activities and contested for various titles. began on Saturday, the 17th of September 2016. The 100-hour course was conducted on weekends and during holidays. The course culminated with a stunning showcasing of the workshop activities, on-the-spot performances and improvisations on 22-10-2016. The director of the course was Mr. Ajay Manchanda. The course is inspired by, and seeks to implement UNICEF and WHO‘s internationally recognized vision of life skills based education. Life skills have been defined by the World Health Organization as, ―the abilities for adaptive and positive behaviour that enable individuals to deal effectively with the demands and challenges of everyday life.‘ UNICEF defines life-skills-based education as basically being focused on triggering a behaviour change or behaviour development designed to address a balance of three areas: knowledge, attitude and skills. This Add on course, during the last decade, has become one of the most significant events in the college calendar and has contributed immensely to the professional, personal and academic development of the participants. Inter-college prizes won by students: Barkha Verma of 4th Sem won a third prize in the University Chef contest on 16th & 17th Feb 2017. Waseem Bhat 2nd sem participated in an all India essay writing competition held on 21st November 2017 at Faculty of social sciences, Delhi University. He bagged the fifth position nationwide and the first position from university campus (undergraduate). The Department held an orientation program on the opening day, that is, July 17, 2015 and welcomed the new students and their parents, and introduced them to the various activities, achievements and values of the Department. On July 21, 2015 the Department organized a one-day theatre workshop which was conducted by Mr. Ajay Manchanda and his team, associated with the National School of Drama. A Gender Sensitization Workshop was held on August 11, 2015 by Ms. Shweta and other members of the NGO, Breakthrough. 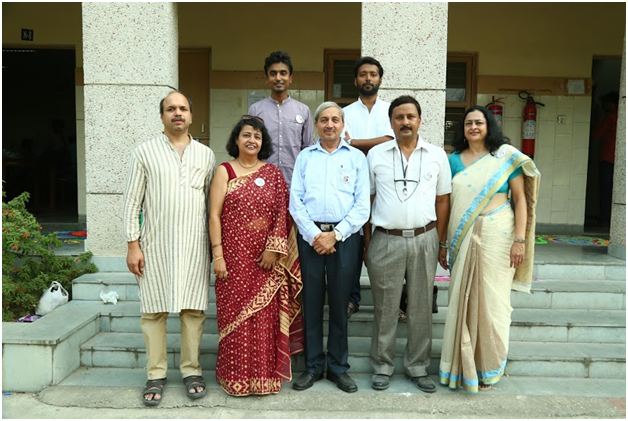 On Sep.05, 2015, the department celebrated the year beginning party, Rapture, on the occasion of Teachers’ Day and also invited its Alumni. On February 6, 2016, the teacher-in-charge, organized a one day Haiku walk for students at Sanjay Van, a reserve forest near Qutub Minar. During the walk students were taught how to appreciate Haiku poems, which primarily deal with various aspects of nature. They were also taught how to explore the linkages between natural phenomena and human emotional response. On February 11, the Department of English organized an open Mike session for students to recite and narrate their creative pieces, which were judged by Konika Kawatra from the Department of English, ARSD College. On this occasion, the Department also launched its magazine the Spectator. On March10, 2016,resource persons were invited from outside to train students in theatre, film, painting, debate and creative writing. From NSD, Mr. Ankur came and conducted a one day workshop on theater. Mr. Anis Popli, the Creative director and Choreographer of Choreotheque, School of Contemporary Dance, conducted a workshop on dance, and Mr. Shantnu Chakravarti on painting. Abhishek Kukreja, who is pursuing Ph. D in film studies from Ambedkar University, held a one day workshop on this occasion on film making. Among the internal faculty, Dr Pramesh Ratnakar held a workshop on creative writing and Nitin Luthra and Lalit Kumar on debate. A two-day literary festival of Department of English was held on March 15 and 16, 2016 by the ZEST, the literary society of the Department. 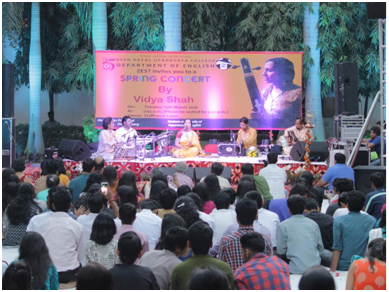 To showcase the changing face of the Department, where instead of teaching only English literature, we teach world literature, Indian literature in translation and various performative arts, the event was inaugurated with a spring concert by the renowned Hindustani classical singer Vidya Shah. Zest began its activities with the Orientation Programme for the upcoming batch of 2014-2017 on 19th July 2014. It comprised of a short presentation on ZEST including its aims, beliefs and activities. While the minds of the new students and their parents were full of questions relating to the course, our faculty sincerely answered all the questions making them know that they had made the right choice by opting for English Honours in Deen Dayal Upadhyaya College. The senior students also happily shared their experiences with the new students to make them feel at home. First Year Representatives- Neetu Kapoor and Mehul Rawat. On 6th August 2014, ZEST-The English Society, DDUC conducted a four hour Jamming Session with 80 students as a kick off to the new academic year. Shri Ajay Manchanda, eminent theatre director from NSD and an extended faculty of Dept. of English conducted the event. The theme of this interactive session was Gender Discrimination and ways to overcome it. This session included activities and games targeted to act as an ice breaker for the students of the department and make them conscious of relevant social issues and make them aware of their environment, both social and natural. ZEST organised its Year Beginning Party-"Rapture" on the 4th of September 2014.A day full of events dipped in fun and frolic alongside dancing and various other delicacies; it was a memorable day especially for the students of the first year. With fun games, Mr.and Miss Fresher, and numerous other prizes, the party went on to become a huge success. On 5th of September 2014, the students of ZEST collaborated to prepare a surprise program for the teachers. The most fulfilling part was the involvement of alumni of the department who also took part in the programme. Continuing its annual tradition, the students of the department, accompanied by faculty members attended the World Book Fair and a one-day national seminar on "TRANSLATION AND THE IDEA OF INDIA" organised jointly by the National Book Trust of India and the Centre for Translation Studies, St. Stephen's College as part of the World Book Fair on 17th February, 2015.